For the past two weeks, I’ve been watching everyone in the centre suit up and head off with giddy smiles of excitement. The idea that today, I would be one of them, was thrilling! My lovely instructor was Anne Japan and my buddy for the day was fifteen year old Robin. The briefing was succinct and humorous all at once and when it was over, my excitement became butterflies. As I put on the wetsuit, the butterflies became bats. The idea of going beneath the water was beginning to criple me. When I feel trapped, whether it’s a big space or small, I have a tendancy to panic, and the last place you want to panic is underwater! My mind was abruptly jerked from my concerns as we put on the weight belts and cylinders. 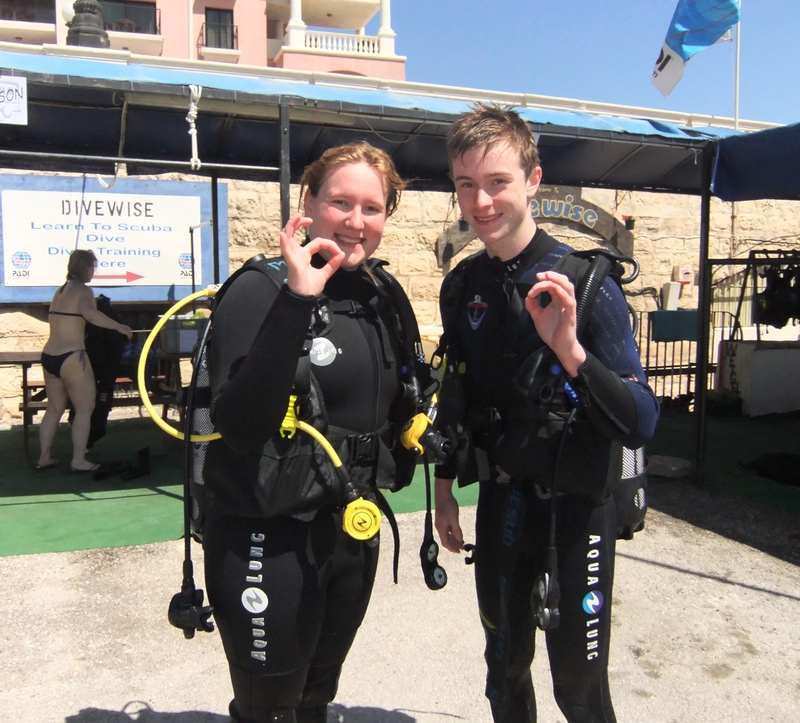 Under the beautiful Maltese sunshine, I was beginning to get warm in the wetsuit, and the addition of 8 kilograms of weight and a cylinder made me break out in a sweat; And then, we were walking down to the water. The cool water around my calves was a beautifully welcome relief and as we stepped in to our waists, the weight of the cylinders and weight belts began to lessen. We stayed close to the wall and put our fins on. Let me correct myself. Robin put his fins on, and I attempted to put mine on, those things are difficult to manage to an unpractised hand! Anne hurried to my aid and within seconds, they were attached. I learnt of the other problem with fins – balance. Having the equivalent of Donald Duck feet made me pretty ungainly! Anne directed us to take a few breaths of our regulators and to gently lower our faces into the water. Robin dove straight in. I hesitated, encouraged by Anne’s friendly smile and supporting hand in mine, and lowered my head under the water. 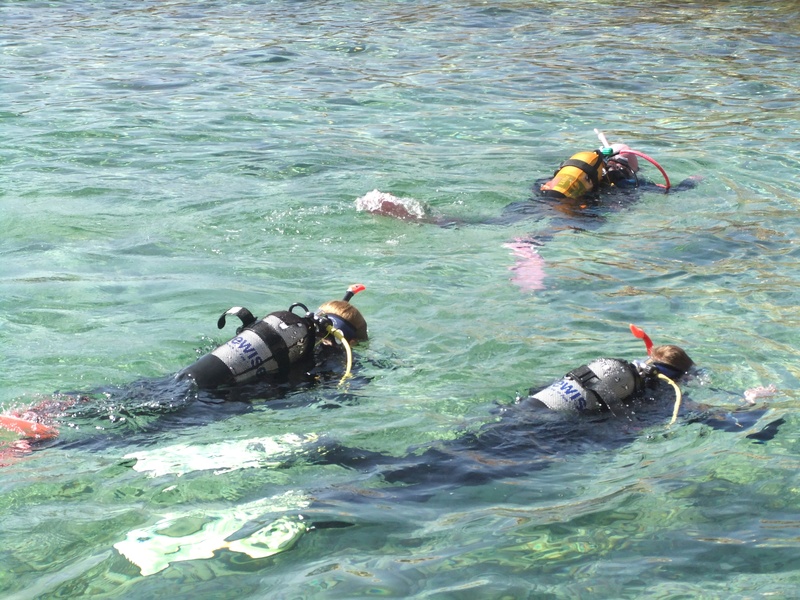 It was similar to breathing through a snorkel, but completely different at the same time. Feeling the sun on the back of my neck made me feel safe, and Anne squeezed my fingers every now and then to assure me I was doing well. 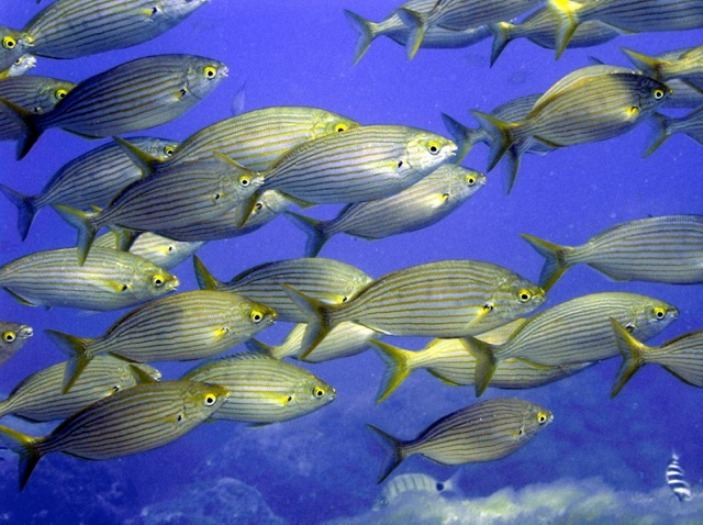 We then practiced swimming with the regulators and fins across the surface. Once again, Robin was an immediate natural. I was a bit more cautious. The cool water embraced me as I lay down in it, breathing through the regulator, and kicking. The fins, I immediately realised, were remarkably easy to manoeuvre when you weren’t trying to stand up in them and propelled me forward with little effort. My arms, so used to being instrumental in swimming, hung uselessly but later came in handy for balance. My breathing, on the other hand, was heavy with stress. I lifted my head above the water every few seconds, partly out of habit, and partly to reassure myself. Anne was right there with me to encourage me back under for a little longer at a time, and then … I saw a fish. It was tiny and a bright electric blue, shooting through the water like a bullet. I was so engrossed in watching it that I forgot to be afraid, and when it was gone, I had relaxed. I was breathing underwater. A bizarre realisation, of course, given that I had been waiting to try it for weeks now, but to realise that I was actually doing it was incredible. 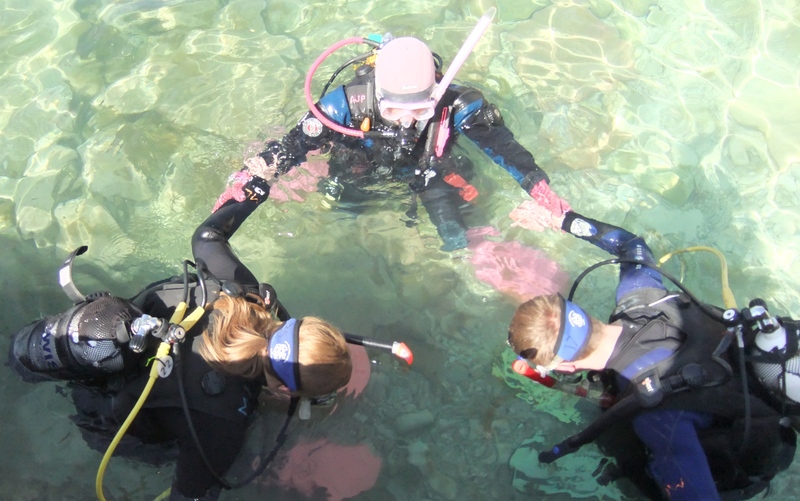 My first real problem was when we tried to sink to the bottom in order to perform our skills kneeling on the shallow floor – and discovered that even with my BCD completely empty of air, I floated. (It was a nice little ego boost to be so light!) Adding another few kilograms of weights addressed that problem and we practiced our skills, which went relatively smoothly. 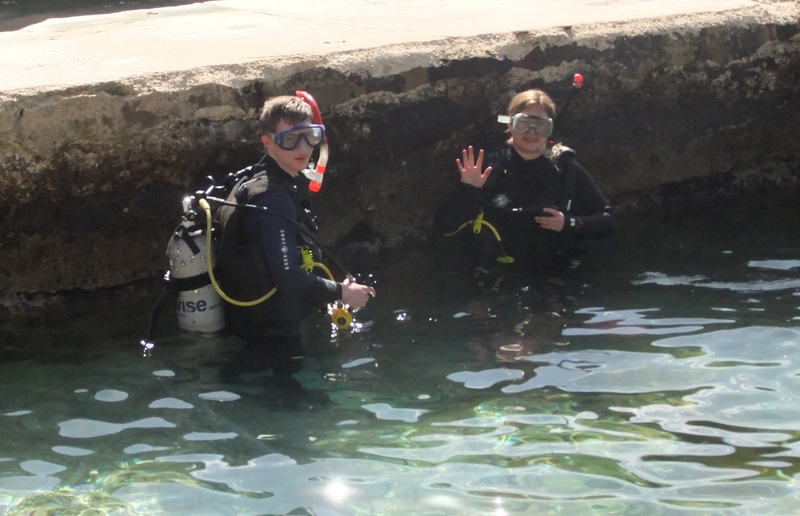 Robin and I both passed the skills section, and Anne pronounced us ready for an exploratory dive along the reef. Skimming the floor, we left the sea pool and ventured out into the open water. And I loved it! We sank lower and equalising became second nature. I didn’t lose my regulator, flood my mask, inhale any sea water, or panic. Instead, I stuck close to Anne and stared round at a world I hadn’t even known existed. My sole experience with fish in the past was looking down at them in a pond, or seeing them laid out on ice at a market. They always struck me as bizarre and a bit creepy, but seeing them from under the surface, they were transformed into objects of fascination. I spent the whole dive looking from one to another, occasionally examining the mountains of sand dunes covered in seaweed and underwater grass below. Anne encouraged me to look up, and staring at the surface, dancing with sunshine, was the most surreal moment of the whole dive. Towards the end of the dive, I looked up to see the sight again and found myself surrounded by hundreds of tiny Rainbow Wrasse and about twenty of the larger Cow Bream. Anne pointed out several starfish to us, demonstrating how they have tiny hooks on their underside which cling to rocks – or to a diver! It was wonderful to be surrounded and immersed in nature. There was so much to see and do that I barely paid attention to my breathing, and during those times, I felt incredibly light and free. The water, after a while, lost its feeling. I instinctively reached out for it and felt nothing. My fear of feeling trapped by the mask or equipment or the water itself seems completely irrational now. The space and quiet nature of being underwater was surprisingly calming. The only sound I could hear was my own breathing! There were no car horns, no whirring computers; I couldn’t even hear Robin and Anne releasing bubbles. I could have stayed there, motionless in the water, and soaked in the peace and quiet for hours! If Anne hadn’t pointed out a few divers only a few feet away from me, I would have never know they were there. We didn’t know what the symbol for brilliant was! The dive ended with both Robin and myself wishing we could have spent longer in the sea. Having adjusted to the relative weightlessness of the equipment in the water, it seemed doubly heavy when we climbed out, and it was a relief to shed it by the baths. I’ve never felt so light – it was like the fastest diet ever! The exhilaration I have felt since getting out of the water was, and still is, overwhelming. 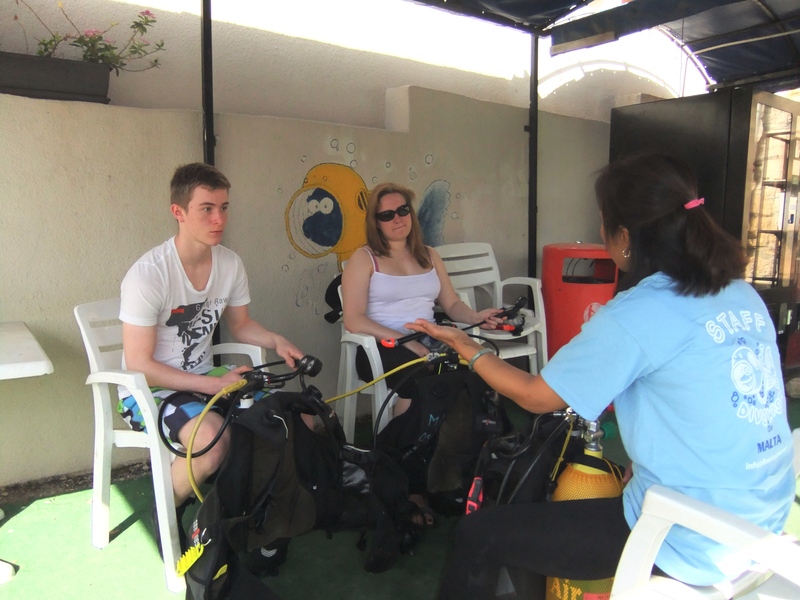 The Discover Scuba Course is perfect, giving you just enough time to adjust under water without overwhelming you, and Anne Japan was a brilliant, kind, and supportive instructor with whom I felt completely safe and secure. I will definitely be continuing to my Open Water Course!